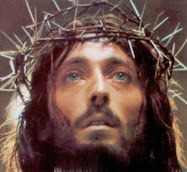 Jesus says to Gemma: “There are only a few in Heaven of your age that have participated in all the pains of my Passion”. The source for this information is from the Italian book "La Povera Gemma" written by Padre Enrico Zoffoli C.P., and published in 1957. The book is a 1014 page hagiography on the life of St Gemma. The webmaster would like to extend a heartfelt thank you to Mrs. Rita Dunn for translating these pages into English for this website. May God bless her for her efforts. “MY GOD , MY GOD WHY HAVE YOU FORSAKEN ME? “….When the sixth hour came there was darkness over the whole land until the ninth hour. And at the ninth hour Jesus cried out in a loud voice: Eloi, Eloi lama sabachthani?” (Mark 15:34). Crucified with the dying Saviour, Gemma is enveloped in the same darkness that He felt; she is oppressed by His same mysterious abandonment. She had to experience the darts from the infernal forces as well as the wounds opened by love, in the most difficult phase of His immolation. When a soul offers herself up for sinners, prayer is not enough. She must be willing to fight for them, and to share in their dangers and suffering, feeling what they feel when they lose God. In a way she must endure their blame, their guilt, their faithlessness, their anger and their desperation. The soul thus feels rejected by God and almost damned. At this moment, an even greater Grace is granted without the souls knowledge, that inspires and sustains her, until in her great suffering she merits the salvation of other souls, even for the most obstinate and indifferent souls. 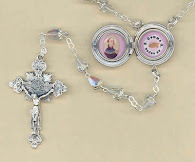 “After the Holy Hour, Jesus let me know all that I will suffer in the course of my life. He told me that He would test my virtue ,to see if I really loved Him, and if the offer that I made to Him was sincere. He told me that I will feel my heart becoming like a stone, I will feel arid, afflicted and tempted. All my senses as hungry beasts will rebel against me. He said: you shall be always inclined to evil; your mind will be tormented by earthly pleasures. Your memory will bring to your mind all you would not want. You shall have before you all that is contrary to God. You will not feel anything that comes from God and I will not allow your heart any comfort. The demons with my permission will do all they can to attack your soul; they will incite you to evil thoughts, you will dislike prayer and you will often endure terrors and fears. No one will believe you and you will suffer scorn and reproof. No one will give you comfort; not even those you look up to. In fact, all will reproach you and you will feel great confusion. What will cause you more grief will be that the Heavens will be like bronze to you [they will be closed to you , -trans.]. Jesus will appear to you as a severe judge. You will pray, but you will feel as if you did not. You will look for Jesus, but you will not find Him. Fr. B. Lavaud stated that when Gemma did not bear any more the wounds on her body, she participated even more intensely in the suffering of the Crucifixion. She experienced the pains of the dislocation of the bones, and the dreadful distension of all the members; the consummation of all the organs and the burning thirst of the Savior. “I would gladly give you blood from every part of my body, but now I can not, so I give you the blood of my heart”. 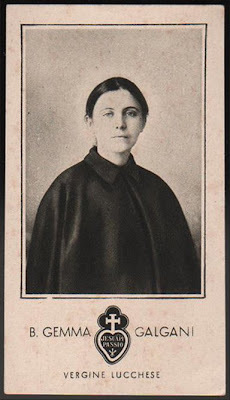 With great sincerity Mrs. Cecilia confirms that: “She was abandoned by everyone, even by her confessor and she was even less cared for by us [Giannini family –ed]. From some words that she would say when suffering interiorly, I realized that she was participating in all the trials of Our Crucified Lord, especially the abandonment. I heard her many times say that she was renouncing everything. She would tell Jesus to remove from her every comfort, and so it was because of this that she had no more signs and no more ecstasies. I remained in the room with Sister Teresa Barbantini, while all the others were asked to leave. Gemma went into ecstasy and she raised herself on the bed with her arms open and her hands distended. She remained in this position for two or three minutes. It appeared to me that she was suspended above the bed. After her body returned to resting on the bed, I said to her: “Tell us what you saw! If you do not tell me, I have not a clue.” And she replied:“I am at a point in which I do not understand anything!’. “Now all I have left to do is to prepare myself for death because I have renounced all and everyone to God”. “Even Fr. Germano? - asked Ms [Cecilia] Giannini - “Yes even him!” She replied. She had asked God to take away from her every comfort. Ms. Giannini resigned herself to this decision made by the saint while she participated in witnessing Gemma’s agony and solitude. “…The words that the saint uttered in her last ecstasy were very moving” said the loyal Eufemia. Talking to the Blessed Mother: “Mom, oh my Mom, make me good! Mom, Mom make me pure! This is the thing that I so desire and that I need so much..”. Talking to Jesus: “Firstly, I desire You in my heart, oh Jesus!...then I want to love You. Then, I desire to see You and to possess You, forever. Oh infinite God...how can You take such pity on me?...Do You know what gives me life? The thought of receiving You in Holy Communion….I wish to receive You, I wish to see You..No, I want to possess You eternally! I wish, my God, for so many graces... I want Your Love. You ask me love, and I cannot give it to You, if You don’t give it to me. I desire also a little more perseverance….. I wish for a good death and then.....Paradise. This is everything to me! But ..what do I feel.. can I abandon myself to this sweetness? Six days later (Nov. 24th 1902) Gemma will confide to Ms. Cecilia Giannini in her last ecstasy: “I have offered all and everyone to God, even Father Germano” (as previously stated above). Devoured by her physical illness, with the coughs and pain in her lungs, she wrote: “I continue to cough up discharge”. Gemma can only write a few lines each day. In the middle of her spiritual storm March 18, 1903 [Gemma writes]: “Believe me, dear dad [Fr. Germano] my life is a tragedy. How can I be at peace in the middle of such adversity? Pity me and answer me. The enemy is working against me... and I? Goodbye dad. I just want to let you know that I am still living”. Only God will measure the depth of the bitterness of that fear. He alone was witness of the pain caused by the unstoppable approach of death, while her conscience was leading her to believe that her life had been a failure. She moans: "Oh my God I am tormented by bad thoughts and Jesus tells me to go to his Mother... and even with these words from Him I loose heart and I cry”. She continues to accuse herself : "I am so very ungrateful to Jesus and the Most Holy Mary. I am so ungrateful to the world, and with my dad[Father Germanus] and with my Mom. How patient they are with me. 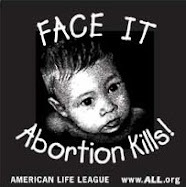 Oh my God.... and You, oh Lord; what will You do? Will you finally get rid of me? No, No Jesus do not abandon me! I will be good... Dear Mom, of souls I want many of them... after all I cry, I cry aloud to Jesus, and I promise Him love, oh my Mother love for everyone! Dear Mother, I have to remind Jesus of many promises. He hides, He loves me only a little, very little, after all ‘He’ is far away, no, no, no. The ‘nunc dimittis’- I will pray at my last moments”. She prayed it with low voice the morning of Holy Thursday, 1903, while holding the crucifix she said : “Oh Jesus, if it is Your will take me now! I can not go on!" Then adds the inseparable Ms. Cecilia... ‘she turned towards the image of the Madonna, and looking at it she said: “Mom, I recommend my soul to you, tell Jesus to be merciful to me...”. Some forty eight hours later, “the soul victim” bent her head, as if she had fallen asleep. Those present could hardly believe that she was dead. Gemma flew towards eternity, and no human eye could look into the last moments of her offering. Thank you for this so much! I feel drawn to, but also feel almost jealous of St. Gemma. A saint that continually has all sorts of supernatural experiences seems to be totally out of my realm as an "ordinary" person. It is more beautiful for me to read about this then to read the words of love that poured from her when she beheld the glories of heaven. Gemma's period of the dark night of the spirit was indeed very difficult for her. On the one hand, much of the time she felt alone and utterly abandoned by God, but then faith and hope would spring forth once again and bring moments of peace amidst the ongoing desolation. Along with this, the devil was freely attacking her, spewing forth all kinds of wicked and evil suggestions and thoughts, trying to bring her to despair or sin. Such is the interior martyrdom of many of the mystics and saints! In fact, Gemma once said that she wishes that she was a "normal", ordinary person. The life of a mystic is certainly not easy! Anyway, I am very glad to hear that you enjoyed this article. Thank you for this. I am taking a Spiritual Theology course on Divine Mercy, Suffering and Conversion and have been reading about other saints experience of Dark Night of the soul. 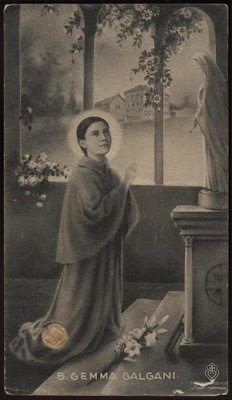 I found this connection to Saint Gemma. This is very revealing I had never concidered Saint Gemma had this expeience, this has helped me so much. The depth of revealing her experience is painful to read but clearly presenting her trials. 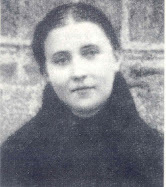 More and more I find reason to seek Saint Gemma's intercession.